A few friends riding bicycles and stopping to spend a long, sunny afternoon on a rocky beach along the Lhasa River is a sweet episode in life. 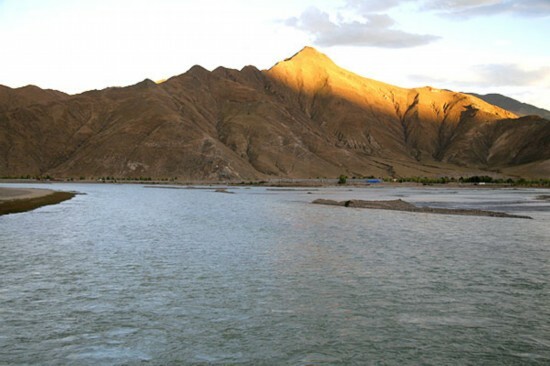 The Lhasa River remains a main subject of interest for me ever since I first saw it on our way from Gongga Airport to Lhasa city. The ragged, rocky mountains on each side cannot stop it from running through them and giving way into a wide, slowly declining valley. And it is in this valley that trees grow, farmland is irrigated, yaks and sheep are raised, villages are set up, small, sweet indigenous watermelons are cultivated, and the roads on which we are riding are built. Looking 300 meters above, one sees the lifeless image of the mountaintop where winds, illusionary lights and dry air are the main elements. The living, throbbing, pleasantly moist world below will convince even the slowest mind of the importance of water to life.